Generally, Economic diversification means adding capability and capacity to other areas of the economy so that in times of slow growth in one sector(s), other sectors can maintain or increase their effectiveness. Usually this means making investments in increased capacity through more advanced means, whether in production methods or human capital development. A typical example would be in Trinidad & Tobago for example. The core of T&T’s economy can be said to be oil and gas. Indeed, T&T is said to be an energy- based economy as oil and gas accounts for a large percentage of GDP. Diversifying this economy then would mean increasing production capacity and capability in other core areas or sectors such as agriculture, tourism, manufacturing, other goods and services, ITeS being one such sector. ITeS is one of the fastest growing industries, globally. India’s flourishing ITeS sector produces almost 10% of its GDP, as it provides goods and services locally and internationally. More advanced nations such as the United States and Canada, and EU countries also derive significant value from ITeS, and this sector is growing at great pace globally. Information Technology enabled Services, and the global information technology industry according to the Computing Technology Industry Association or CompTIA, was expected to reach approximately 3.8 trillion in 2016. T&T must engage this industry, as it offers a real and sustainable path to growth and Development. The Government of The Republic of Trinidad and Tobago (GORTT) in 2011 initiated a process, which has culminated in the award of an IADB loan for a project entitled Global Services Promotion Programme. The Ministry of Planning and Development has since published an Expressions of Interest notice on its website as a point of departure and this augers well especially in today’s global economic circumstances of low oil prices. 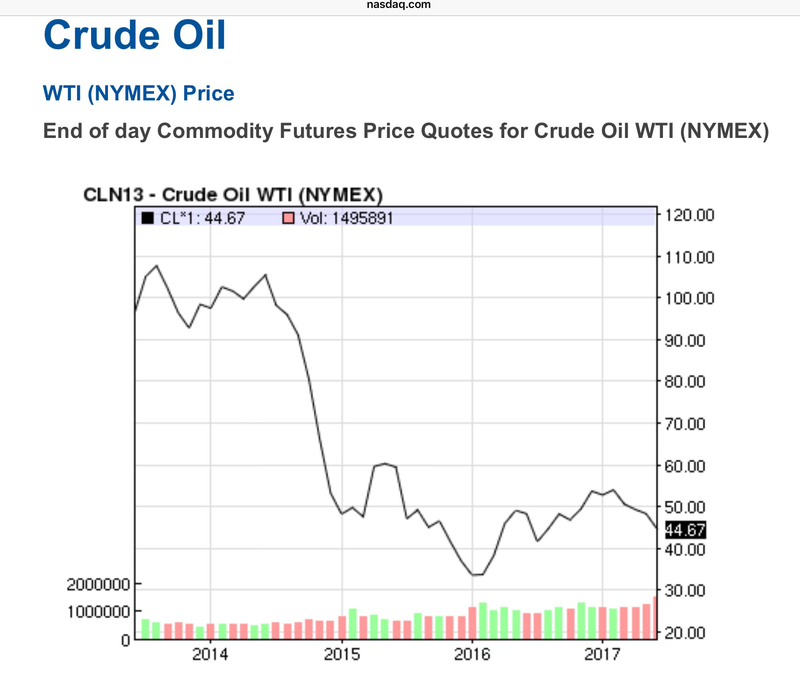 Since 2014, there has been a precipitous fall in oil prices from a high of almost USD 110 to a low of $44.67 today, June 16, 2017. It can be noted now, that the price of oil in the 2016-17 budget was USD 45.00. The need for diversification is lucid and urgent. The need for innovation in agriculture, manufacturing, tourism, sport, culture, and education as revenue earners requires decisive action, in pure and simple words. Urgent action against inefficiencies, economic depressants such as crime and corruption is of utmost importance in a non-partisan approach to the future of Trinidad and Tobago. But for diversification to achieve value generating capacity and capability is not simple and easy. Sinc 2011, the Ministry of Planning has been engaging ITeS as a strategy for economic growth. In six years, the initiative had only just reached the point of departure where financing has been arranged through the Inter-American Development Bank. An Expression of Interest has been formulated, responses are to be submitted, which will then be evaluated. The process will then move to the selection and award of contracts and then implementation. The length of time this process will take is open for discussion. The implementation of strategies may very well take another few years, given the bureaucracy. Can Trinidad and Tobago wait that long? Facing austerity measures, facing uncertainty in oil prices, and economic hardship the population may very well seek a change in administration. Further delays are expected and hence time is given to other players in the global market to achieve market gains in ITeS. This will make diversification even harder. Given these circumstances, Trinidad and Tobago needs a “shot in the arm” to leapfrog into the sphere of sustainable economic development. All is not lost, since there exists a mechanism for achieving economic prosperity without the reliance of the oil and gas sector. However it requires a transformative process as opposed to diversification. In diversification of the economy new industries producing new products and to changing demographics, change occurs as new sectors emerge to compete in global markets, providing sustainability in local development. Transformation creates the environment for all different contributing dimensions of the economy to flourish, whilst creating new ones. Pre-1945, Japanese society embraced a militaristic culture, gaining notoriety as a fiercesome nation. It’s Military strength was the basis for national development and stability. Imperial Japan was the only non-Western world power and a major force in East Asia . Without delving into historical antecedents and the effect these may have had on Japanese society, it adopted the doctrine of “Enrich the Country, Strengthen the Armed Forces”. Japan’s participation in World War 11 was strong, fearsome, often violent but honorable to its culture. It was a military power. All of that changed with the bombing of Hiroshima and Nagasaki. From then till now Japan has been transformed from a world military power to a world economic power. The environment was created for Japan’s economic transformation into a world of economic power with its surrender. The transformation was spectacular. It was epic. But it took the will and good sense in the face of the realization that their country could have been occupied and ruled over by another country for Japan to surrender and abandon their old ways. India has also been transformed into an economic power house in the last twenty-five years. From a weak economic and geopolitical role, it has blossomed into an economic powerhouse, with a human development strategy, coupled with a strategic approach to engaging the global economy. ITeS contributes to 10% of GDP. The transformation was achieved mainly in part through a political maturity that allowed an understanding of the threats to its existencial sustenance and survival as rivals built capacity and capability around their borders. In Trinidad and Tobago, transformation is needed, in order to diversify. Economic transformation will be achieved when a rapid, fast-tracked approach to economic development is adopted, an all out embrace of the digital economy. The Digital Economy transforms the old and tired models of economic development and breathes new life into the traditional pillars of the economy in agriculture, manufacturing, tourism, sport, education, culture etc as new and exciting opportunities will emerge as are presently being achieved by smaller, less resourced countries. This Transformation, the creation of an environment for prosperity in a sustainable economy, is needed in Trinidad and Tobago. The unprecented velocity at which the Internet has developed as a backbone for globalization consolidation as a driver of economic wealth, social transformation and exiciting opportunities requires countries, especially small countries, to establish digital strategies to take advantage of these opportunities. In order to do so, countries must engage in a strategic thinking and planning initiatives to emerge and identify their own competitive advantages as a basis for digitalizing their own products and services. With this, a second stage of relentlessly executing will follow to successfully achieve objectives. The third stage of iteration will create innovation and advance new objectives demanded by the global environment. Strategic thinking will seek to emanate insights of the resource base of the country, which, no matter how seemingly insignificant they appear, can be converted to a revenue generating asset, in today’s world of high demand for uniqueness. The capability and accessibility of the new smartphones, tablets, the Internet of Things, satellite phones and wifi connectivity have created a platform for products and services which were never in demand prior to the emergence of the Digital Age. Deep horizon environmental scans are needed. It does not require political will or expediency. The democratization of technology, as Thomas L. Friedman posits in The Lexus and The Olive Tree, will ensure pressures from populations demanding more bandwidth and digital services as owernership of technology become commonplace as it already is. When ,not if is the reality. It is therefore a key imperative that infrastructure for digital age living is developed. Internet bandwidth, resiliency and scalability are key front-burner issues, especially in a traditional global economy that has become sluggish. Internet access reliability, speed and cost effective are issues for immediate attention, especially in lower income countries such as the island economies of the Caribbean. With the exception of Trinidad and Tobago, and the emerging Guyana as oil and gas driven economies, the future prospects of the smaller islands are vulnerable to traditional economic growth and Development through tourism and subsistence agriculture and farming. In these smaller islands, their economies depend to a very large extent on walk-tourism from vacationing tourists from cruising. Cruiseshipping is a big deal, and the growing cruising segment from yatchies from actress the globe are encouraging. But the model of economic dependence of tourist patronage is risky, especially as the island’s are vulnerable to natural disasters like hurricanes. Taking advantage of the digital economy is a lifeline that brings into play, culture and content, such as music, folklore, design, fabric and others. The initiative is a step in the right direction, and it makes championing the cause for the digital economy of small island states easier, with the political will already headed in the same direction. On fruition, it will be significant as island sets compete in a technologically leveled digital playing field. However there are some concerns to be raised. The Single ICT Space is a derivative of the Regional Digital Development Strategy 2010-2014. In commenting, the Caribbean Telecommunications Union speaks to the difficulty of creating the Single ICT Space. The CTU says ” it is a complex ndertaking which presents many challenges.” It is also dated. The Workplan, coming from this regional body, reflect the traditional ICT thinking focusing on a regional collective of legislative and regulatory framework, infrastructure and policies with very little on the actual production of digital goods and services i.e. Content, Services in Artificial Intelligence, Programming, Design & Development. In the final analysis, it is cumbersome, complex and complicated, and bureaucraticly boggged down by the lack of resources available to complete such an initiative. It may very be a premtive strike and with self interest by the CARICOM. The larger countries in the region may very well choose to got alone, since it requires action now, not five years from now.